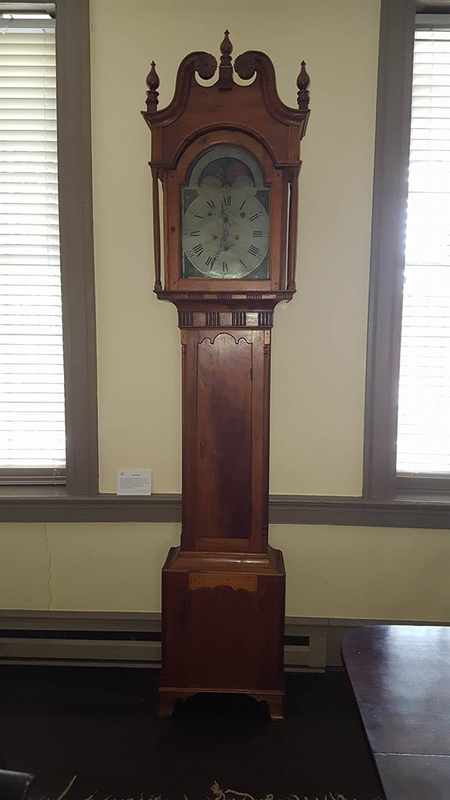 Craft tall case clock, 100 ¾” tall by 23″ wide by 11″ deep, case has been refinished. Jacob Craft, who was probably born about 1765 in the Marburg region of Germany, immigrated to the United States and eventually settled in Shepherdstown, Virginia in the latter part of the eighteenth century. He is listed in the Personal Property Tax Lists for the Year 1787 for Berkeley County, Virginia. Craft established himself as a clockmaker in Shepherdstown, a business he continued here until sometime prior to his death in 1825. Craft and his wife Catherine had nine children between 1788 and 1804, three girls and six boys; the Crafts recorded each birth in their Marburg Hymnal, writing in English script. The hymnal is now in the possession of St. Peter’s Lutheran Church in Shepherdstown. The Jefferson County, VA Federal Census of 1810 lists the Craft household with only seven members; one free white male over the age 45, one free white female over the age 45, one free white female age 16 to 26, two free white males age 10 to 16 and two free white males age ten or younger. In April 1799, Craft purchased the western half of Lot 29 on the north side of East German Street. The deed stipulated that Craft would pay ground rent of three shillings sterling on September 29th each year to Abraham Shepherd and that he would erect on the lot one good dwelling house twenty feet long and sixteen feet wide with a stone or brick chimney. Craft sold the property in January 1819. In December 1812, Jacob Craft bought a portion of Lot 25 fronting thirty-six feet on the south side of East German Street. A. D. Kenamond, in Prominent Men of Shepherdstown During Its First Two Hundred Years, states that Craft’s home and shop were both located on this parcel. This property was sold by the Administrator of Jacob Craft’s estate in January 1833 following the death of Catherine Craft. Records of St. Peter’s Lutheran Church, translated and reprinted in Gladys Hartzel’s On This Rock: The Story of St. Peter’s Lutheran Church 1765 – 1965, contain the christening records for eight of the Craft children and also indicate that Jacob Craft and Catherine Craft both contributed funds for construction of the new church building in 1795. (Through 1801, the Church records spelled Craft with a K.) In addition to being an skilled artisan and active member of his church, Craft also served three one-year terms as a town Trustee, 1805, 1811 and 1815. This walnut case clock has a broken arch top with carved daisy-like rosettes. A turned finial on a plinth with curved reeding is mounted between the arches of the hood while the front corners have turned finials atop fluted plinths. The arches and upper sides of the hood are faced with double cove molding separated by a string of wall-of-Troy molding. Reeded wood columns are applied to the corners of the hood between the arch molding and the molding above the door opening. Turned columns are placed at the front and back corners and the very base of the hood is adorned with spaced reeding. The hood door and side windows are tombstone shaped. The waist of the clock is topped with spaced reeding; horizontal molding above the waist door continues around the sides, down the back and around the bottom just above the base section of the case. Reeded corner columns and a solid walnut door with shaped top complete the ornamentations of the waist section. The base is topped with cove molding and has a shaped center panel flanked by smooth corner columns with turning at the tops and bottoms. The case rests on flared feet that are slightly shaped. The clock’s works are an eight-day movement with time and strike and include a moon phase display and seconds and date dials. Hours are displayed in Roman numerals while seconds, minutes and dates are Arabic displays. The corners of the dial have painted floral decorations on a green background and the dial is signed JACOB CRAFT just below the ringed winding holes. The walnut finials are probably attached to the hood with round tenons. Molding is flush nailed to the hood and each rosette is attached with a screw driven through the center. The pine top is open dovetailed to the lower side panels. The upper side panels are probably dovetailed to the scroll board (the joints are concealed by applied reeded columns). The lower side panels, which are nailed to the upper side panels with nails driven from the inside, are through tenoned to the three-part mitered bottom frame. The rear columns are dadoed to the frame at top and bottom while the front columns may be surface glued. The four-piece inner frame of the door opening is lap-joined and then rabbeted to fit around the clock face. The hood door is four pieces, mortise and tenon joined and further secured with wood pegs. The side boards of the waist extend from the seat board to several inches inside the clock base. Molding and corner columns on the waist are nailed and glued in place. The front stiles and case sides are joined by a single rounded glue blocks extending the length of the case side. The top and bottom rails in the waist are probably mortise and tenon joined to the stiles. The waist door is solid walnut with a shaped top. The door is fashioned so the center portion fits within the door opening while the shaped top and narrow side and bottom edges overlap the opening. On the base, full length glue blocks join side panels to the stiles and the back. Cove molding at the top of the base conceals a three-board frame where the waist and base elements are joined. The columns and moldings on the base are all surface nailed and glued in place. Upper and lower rails in the base are probably mortise and tenon joined to the stiles. The opening created by this framing is filled with a solid board over which the shaped center panel is attached with nails driven around the perimeter. The two-piece shaped and mitered front feet are mounted to square posts and secured with shaped glue blocks at the front and side. Rear feet are shaped on the sides but not the back and are mounted to the case in the same manner as the front feet. The back of the case is ¾ inch-thick solid walnut set in rabbets in the base and waist and is secured with glue blocks in the base and nails in the waist section. The bottom board of the case is secured with glue blocks. The brass clock works are driven by two weights attached by stranded cables to smooth winding drums. The front and back plates are pinned to four shaped pillars with most of the arbors and gears contained within the two plates. The works are secured to the clock’s seat board with hooks over the lower pillars. The painted iron dial is attached to the works by use of a false plate that is signed Osborne Manufactory, Birmingham. False plates were more or less universal adaptors that allowed a clockmaker to purchase painted dials from distant manufacturers without worry that the dial feet might be in an inconvenient location when attached to the front plate of the works. The case has been refinished. Arch supports have repairs and some molding is missing or damaged. Center panel on the base shows repairs. Glue blocks in the base section appear to be of newer material. Two other observations suggest the base may have been modified or shortened; positioning of the corner columns does not match and the bottom portion of the center panel has been cut off. Overall, the clock is 100 3/4 inches tall, 23 inches wide and 11 inches deep.